It's important to remember that the Camo Edge Pro is a system, not just a tool. It's the combination of power source, accessory, and fasteners that deliver professional results. A beautiful deck improves just about any outdoor space. In a way, it brings the indoors outside by creating room for furniture and food preparation. It adds a room to the house to socialize, grill, relax, and enjoy nice weather. Like any project, it takes a lot of effort to make sure that it looks good and functions well now and provides enjoyment into the future. Pros have used handheld jigs for years but it’s tedious work: bend at the back and knees – load one or two screws at a time in the jig, drill, and repeat until the deck is finished. When we saw the Camo Edge Pro Deck Fastening System, we knew we might be looking at the solution to such a back-breaking job. There are multiple issues that stem from the basic deck building process. Wood swells and retracts as moisture levels change, leaving loose boards with deck screws that pop up inviting toe injuries. Those same screws can chisel through wood fibers as they driving and split your beautiful new deck boards. And of course, the screws are exposed on the surface, interrupting the look of continuous wood grain. The Camo Edge Pro addresses the pinch-points of deck building by using collated fasteners on an extended driver. The fasteners enter the side of the wood at an angle where they are hidden as they sink in. It’s an elegant solution that will certainly make the work easier if the tool is up to the demands of the jobsite. Powered by a Milwaukee corded drywall screwdriver, the Camp Edge Pro fastens 1-inch to 1.5-inch deck boards with proprietary 2-3/8 inch fasteners. The collated fasteners are auto-fed through the process, so you’ll only have to stop to reload. The Edge Pro tip aligns the fastener for the perfect entry angle every time. The system is designed to keep you on your feet and eliminate much of the stress and fatigue on your body. Camo Fasteners come collated in ProTech coating or stainless steel. Fasteners secure deck boards and remain hidden. Partnering with Milwaukee certainly lends credibility to the whole tool. There’s plenty of power and Milwaukee’s quality builds additional confidence in the system. The model used is Milwaukee’s 6742 with a 6.5-amp motor delivering up to 4000 RPM. We’d be really excited to see the new Milwaukee M18 Drywall Screwgun as an option when it releases or even a universal adapter so users could fit on a screwgun they already own. You may wonder why Camo’s deck fasteners feature a blunt tip that makes getting started a bit tougher. This is an intentional design that prevents splitting the wood since you’re going in at an angle right on the edge. The reverse rake profile removes material rather than pushing into the wood so the surrounding fibers aren’t stressed. Blunt fasteners are more challenging to start, but they are the reason the wood doesn’t split. You’ll notice a reverse thread pattern at the top of the fastener. 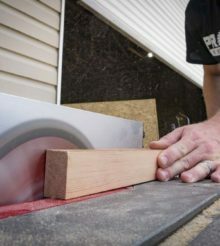 As the lower threads enter the joist and sink in, the upper threads pull the deck board into it, creating a more secure connection than standard deck screws. The Camo Edge Pro makes deck building much easier. Camo makes deck building remarkably easier. Unless you’re shorter than the average person, you’ll still be bending a little bit and really tall users may wish for some additional length. However, the constant up and down – bending, squatting, kneeling, and getting back up again – is eliminated and makes a huge difference. The Camo Edge Pro in action. The Camo Edge Pro allows for no-gap installation, but we left gaps in this installation with spacers. We leave gaps on all our wood installs because no matter what kind of wood you use – species, pressure treated, etc – wood expansion and contraction is inevitable. In fact, my coworker Preston and I wondered how the side-fastened boards would behave over time with this movement and specifically if the boards would start cupping. The fastener design seems like it will help prevent screw popping and loose boards, but it will be interesting to come back next year and see how it’s doing. We finished the job far less fatigued using the Edge Pro than when we use our traditional tools. On any jobsite, less fatigue means fewer mistakes and a safer environment. The Milwaukee screwdriver is comfortable in the hand and Camo’s handle is easy to grip. The deck went down faster and we were a lot less worn at the end of the day! It’s important to remember that the Camo Edge Pro is a system, not just a tool. It’s the combination of power source, accessory, and fasteners that deliver professional results. You’ll need to use Camo’s proprietary collated screws which will likely add to the cost of materials. Be sure to build this in to the quote. I’d really like to see options for the power source. In this age of cordless tools, it seems like a no-brainer to offer a cordless solution or a way to use a driver the user already owns. We absolutely recommend the Camo Edge Pro Deck Fastening System to other professionals, especially if they build a lot of decks. For one-off jobs, a carpenter might not find the $325 price tag worth it. If decks are a large part of your business, it’s certainly worth it.